Hey folks! How are you? Take a seat, pour yourself a mug of something warm, and snuggle up as we talk about one of the hottest drinks this festive season. That’s right I’m talking about glogg. In the UK we drink A LOT of mulled wine this time of year. You can buy ready made spice packs in all the supermarkets. Simply heat a bottle of red wine with cinnamon, cloves and citrus peel and you’ve got yourself a British Christmas staple. If you’ve travelled to Europe for the German Christmas markets you’ll also be familiar with glühwein the continental version of mulled wine. My favourite variation on the glühwein recipe is feuerzangenbowle which is exactly the same as glühwein except for the large rum soaked sugar loaf that is hung over the hot wine, set on fire, and encouraged to drip into the drink. The term “glogg” is actually an offshoot of the German term “glühwein” so it’s no surprise the recipes are quite similar. What they all have in common is a red wine base. They almost always include cinnamon, cloves and citrus peel. Glogg, however, takes things a step further with dried fruits such as raisins, apricots, prunes, or peaches added to the mix along with nuts and spirits / liquor. The wine is then heated along with all of the added extras until the flavours have infused the drink. 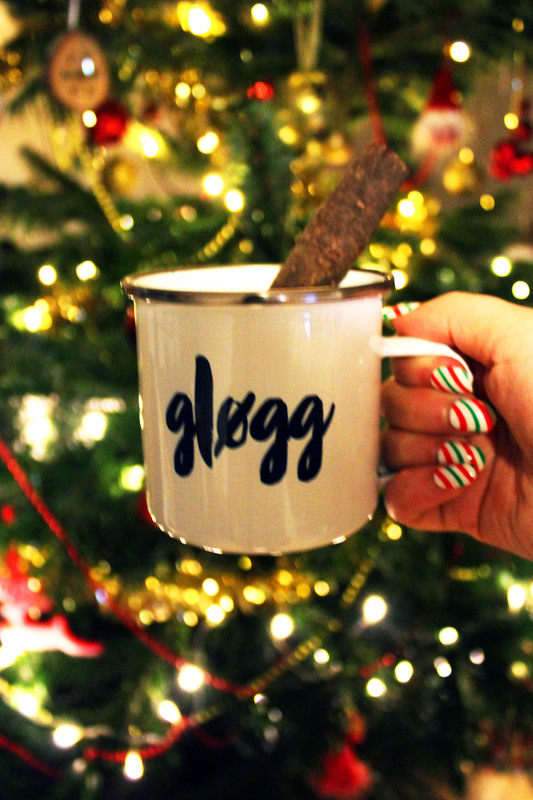 The act of preparing a batch of glogg, lovingly slaving away over the hob as the wine heats through, and sharing a cup with family and friends is oh-so-hygge! So check out my recipe below and bring some Christmas hygge into your life. We’ll be sharing our first batch of glogg when we open our new home to visitors for the first time in December. We’re not quite finished decorating and there’s a lot of furniture still missing (TV unit, spare bed, desk etc) and curtains too but it will be nice to have people visit. Hopefully after a glogg or two they won’t notice the work still to do. Still, it will be lovely to invite our family and friends to share a cup of glogg with us for the very first time. Add all of the ingredients (except the almonds) into a heavy bottomed sauce pan and heat gently stirring frequently. Once the sugar has dissolved, pour into mugs. Top with the flaked almonds and serve while hot. Before I go, I had to mention these adorable enamel glogg mugs which I used in my photos! You can get them from Not on the High Street for £12 each. Aren’t they the cutest! 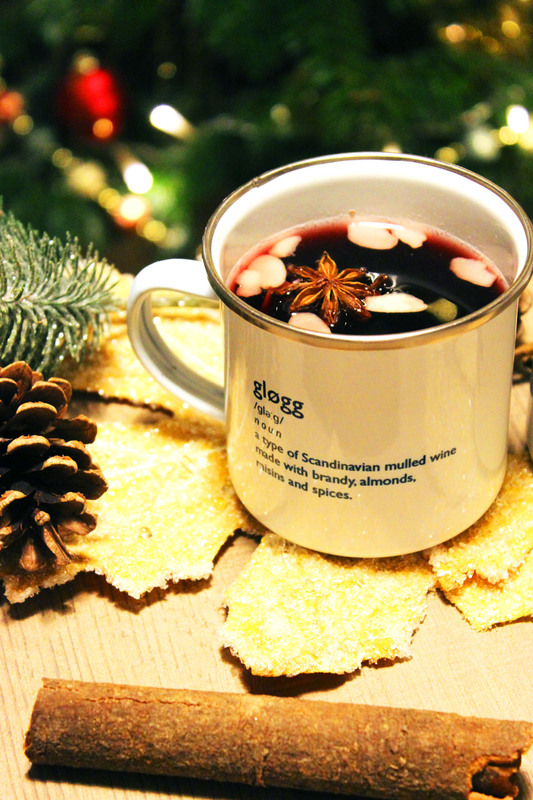 I love mulled wine and gluhwein, so I would like to try out glogg. If you’re a fan of the others you’ll definitely enjoy glogg! Cheers! So exciting to throw your first party in your new house – this sounds like a brilliant way to celebrate 🙂 We make mulled wine every year but I’ve never thought to add dried fruit and nuts! It just makes it that little bit extra special! Glog is addictive stuff! I love it because it has an extra kick the mulled wine is lacking… How lovely to be in your new home in time for Christmas – here’s a toast to you a your new nest. 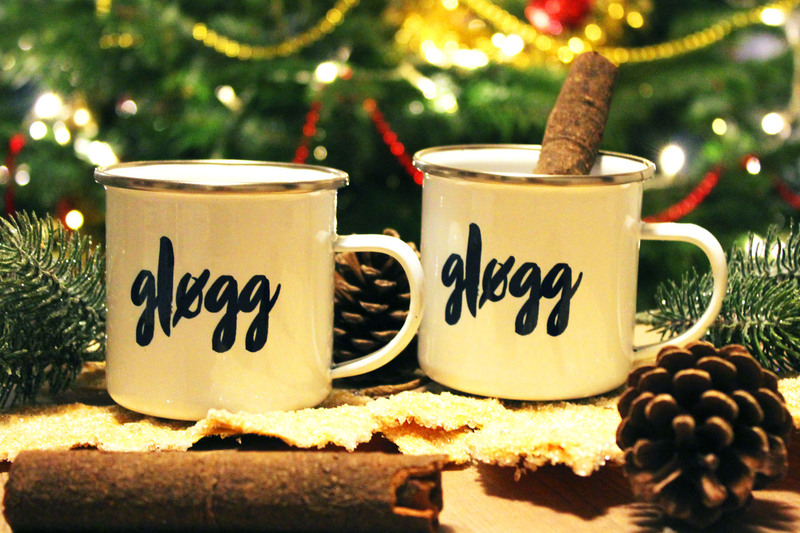 Love your gløgg mugs and your friends will certainly enjoy this for your house warming, what a brilliant idea! I haven’t tried it but the addition of brandy and the dried fruit sounds so good, will give it a go. Thanks Lucy. They were an impulse purchase 😛 oopsy!